Does Dyma-Burn Xtreme Really Work? Dyma-Burn Xtreme is a fat loss supplement that uses some of the hottest dietary ingredients that are trending right now. The overall effect is said to create thermogenesis, revving up your body’s core temperature so that you’ll have an increased metabolism and lose weight naturally. But can it really work? The big concern most people have when it comes to starting a diet is failing in the first month or so. This could be due to trying and failing so many times in the past, or being subjected to yo-yo dieting where you start a diet, are super religious about it, but then you end up crashing and returning to your old weight, or worse, even heavier than before. A weight loss pill can sometimes be used effectively to get through the toughest part of any diet: the start. Dymatize, the makers of Dyma-Burn Xtreme, claim that you’ll be able to have more energy and burn more fat when taking their supplement than you would by simply dieting an exercising alone. It’s also supposed to help with your metabolism, so you’re breaking down foods better and able to lose weight at a faster pace. Since it can be hard to muster up the energy to exercise while following a calorie-restricted diet, the idea here is that you’re getting an energy boost from these pills which should propel you to go work out, which will help burn more calories or build lean muscle, all of which will help you get more dramatic results in less time. Shows like Dr. Oz have added a fair amount of hype in recent years for all-natural plant-based weight loss aids like raspberry ketones and green tea extract. A product like this is capitalizing on that hype and is adding several different ingredients that each individually have a buzz surrounding them. 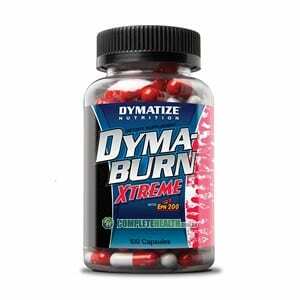 The cost of Dyma-Burn Xtreme is $50 for 120 capsules. However, it has a few different versions on the market, and you can find it for as low as $20 for 120 capsules if you don’t mind that it doesn’t contain raspberry ketones. When comparing this cost to other diet pills on the market, especially those containing raspberry ketones or green tea extract, these prices are in line or perhaps a bit higher if you pay retail from their official page. You’ll need to take this daily if you want to see the best results. The dosage is two pills twice daily for a total of 4 pills taken. You take one dose in the morning and one in the afternoon, so you shouldn’t be kept awake and full of energy when it’s time for sleep. The caffeine it contains from the green tea extract is what is giving you that energetic feeling, so it’s good that they don’t have you taking this later in the day. Peer reviews suggest that Dyma-Burn Xtreme works, at least to some degree. As far as clinical research goes, they cite a study performed in Texas that shows that compared to a placebo in a double-blind test in which it appeared that the test group experienced better results than the control group. Details of this research are not provided, and it’s unclear if this testing was funded by Dymatize or not. There are several studies that have shown the effectiveness of green tea and EGCG in regards to weight loss, so there are at least a few ingredients in this that have been shown to work. The other concern that you should always consider when evaluating a weight loss or diet product is whether it actually contains what is stated on the label. For that it’s important to look at the manufacturer to see how long they’ve been around and to determine whether they are following best practices when it comes to nutritional supplements. In this case Dymatize has a good track record of success, has a wide line of nutritional products that typically get rated highly. This means there’s a good likelihood that the ingredients that are stated are actually in the pills. Dyma-Burn Xtreme is getting our Solid Try rating, as it has been shown to work for some that try it, but not for everyone. Those that say it works say it works really well, and for those that were disappointed, many of them say they got results, but the results weren’t up to their expectations. IF you’re looking for a way to help you shift your diet to more healthy foods and portion sizes, but are afraid of being too hungry to stick with it, this may be a way to help you over that hump. It’s always good to use diet pills only as a catalyst, and not as a long term solution to maintaining a healthy weight. Sometimes it can be hard to deal with hunger pangs and cravings, and to make that change you may need a boost from a pill such as this. What do you think? Does Dyma-Burn Xtreme work or not? Does Skinny Fiber Really Work? Does Juice Plus Really Work?